McKinstry Skip Hire have just added three stunning new Renault trucks to their spectacular fleet of vehicles. We caught up with transport manager James Crossett to find out more about the fantastic fleet of trucks and trailers operated by one of Northern Ireland’s premier waste management companies. 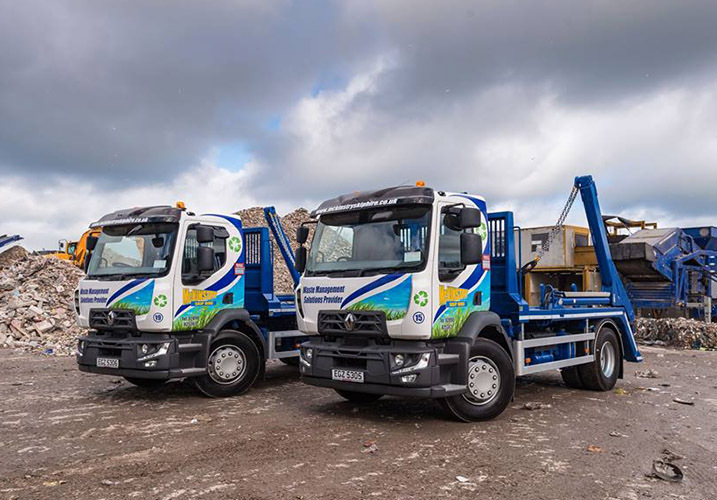 In April, 2017, McKinstry Skip Hire in Nutts Corner, County Antrim took possession of two new Renaults from Diamond Trucks in Mallusk –a beautiful pair of Range D High 4x2 R 250 E6s complete with VDL skip loaders. In May, they added another one. Joining McKinstry’s 50-strong mixed fleet, the Range Ds were put to work across Belfast, Greater Belfast and most of Northern Ireland, supplying skips for both large construction contracts and private customers. Fitted with Renault Trucks’advanced 6-cylinder in-line DTI 8-litre engine, the Range D’s low environmental impact was also crucial, supporting McKinstry’s business ambition to achieve a resource efficient Northern Ireland, with zero waste to landfill and the development of a sustainable and circular economy. In short, the Range D is greener with lower emissions and the fuel economy is also outstanding. “The quality of the build and reliability are excellent and our drivers really like them –especially the vehicles’manoeuvrability, which is crucial in alleyways in city centres and on building sites. The quietness of the vehicle is also significant, particularly when they are delivering skips to private customers early in the morning. The drivers are big fans of the cab, too,”James revealed. McKinstry Skip Hire specialise in waste management and recycling, skip hire, waste services, biomass, Duty of Care and quarry products. 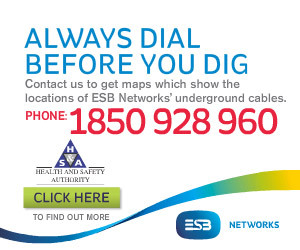 Headquartered at Nutts Corner, Northern Ireland, they also have plants in Belfast and Portadown. Just over a decade ago, they were taking 90% of all waste collected across Northern Ireland straight to landfill. Today those figures have been reversed, with over 90% of waste now recycled. The company has worked hard to become a leader within the waste management industry by making significant investments in their Material Recovery Facility​(MRF) and fleet of vehicles, implementing an Integrated Management System and building a strong committed workforce. The McKinstry Skip Hire Team continually work with their customers to change the perception of the waste management​industry with the aim of creating a more collaborative and innovative approach for businesses. Originally established as a waste disposal company, McKinstry Skip Hire has grown from those small beginnings to offer its expanding client base a comprehensive package of waste management and resource solutions. McKinstry Skip Hire Ltd. –which was established by the late Albert McKinstry in 1970 - provides cost-effective and efficient waste solutions to both the public and private sectors with a specialist focus on the collection and recycling of dry waste and all construction and demolition waste streams. The state-of-the-art Material Recovery Facility at the company’s head office in Crumlin, which was opened with an initial investment of £1.5m in February, 2008, is one of the leading waste management facilities in Northern Ireland and has been designed to ensure safety is maintained at all times by including circulatory routes, a managed entrance and egress points to the different locations within the MRF. “We have been dealing with Renault for the past ten years or more and had previously bought seven-and-a-half tonne skip loaders,”James notes. “A year ago, we went for the new D Range Renault 18-and-a-half tonne skip loader and then earlier this year we added two more, followed by a fourth one in May. The fleet in total comprises 35 trucks, 15 trailers and two service vans, including seven bin lorries from seven-and-a-half tonnes to 32 tonnes (Renault, Volvo, Mercedes and DAF), one 32-tonne tipper and eight 32-tonne roll on roll offs (two MANs and six DAFs from TBF Thompson). “We have two seven-and-a-half tonne skip loaders, eleven 18-tonne skip loaders, seven units towing biomass trailers (mainly DAF and one Renault double-drive) and a 26-tonne Volvo FL rigid for transporting our JCB waste handlers for council work,”says James. “Fleet maintenance is obviously of vital importance and we work with TBF, Renault and Spring & Airbrake for parts as well as Kerrs Tyres and Philip White Tyres. “We run a day shift and a night shift in the garage and the engineers and fitters work with me around the clock on safety checks, maintenance, tyre fitting, etc. “We also have a lot of plant in the yard –waste handlers, shovels, excavators, forklift trucks, etc. –and we look after all of those in our own garage too. Of course, the great fleet is no good without exceptional drivers and our drivers are the backbone of the operation. We have a team of 35 at the moment and they are top class.”James himself is Class One and can go out on the road when required.